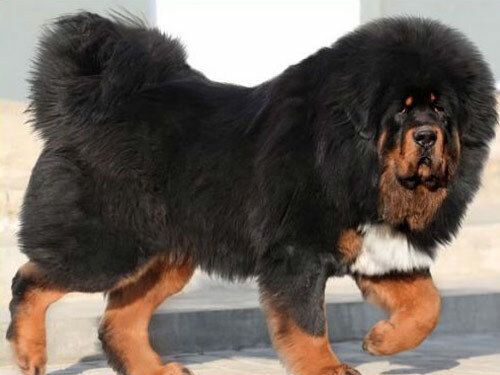 The Tibetan Mastiff is cute and looks similar to a stuffed animal, or even a bear with their full fur coats and big eyes, but beware as they are fantastic watchdogs. They can be territorial and also rather stubborn, making training them a bit of a challenge. They adore spending time with their families and protecting them as well. Upon engaging with strangers they may not respond with friendliness as their first priority is to always serve and protect their families. They can bond with other animals residing in the same household and can be child's best friend. At times, they have been known to get aggressive with other children they do not know that they feel may be a threat to their children living in their home, so do watch them carefully with other little ones. The Mastiffs can reside in very cold temperatures without any issues at all and they are also very affectionate. The Tibetan Mastiff is a very low maintenance breed when it comes to activity requirements. They do not need a lot of attention to run and play outdoors as other canines, as they can be content with a simple walk on a leash each day. They highly dislike being trapped or confined in a small space for long periods of time and can become quite aggressive if those circumstances are mandatory of the dog. Grooming this dog will require additional efforts during those months when they are shedding a lot and the rest of the year they will need brushed on a regular basis as their fur coats are very thick. They can adapt to virtually any climate range, but prefer to not have to reside in one that is hot or humid. These dogs also tend to bark quite often in the evenings, and it can be rather loud. Simple dogs that are low maintenance, the Tibetan Mastiff is a fun and loving breed that can grow to be a large dog as adults. Generally they weight around ninety to over one hundred pounds, so apartment living may not bode well with this type of canine. CHD and having an overactive thyroid gland are the only two minor issues related to health they tend to encounter. In rare occurrences, they have developed seizures, entropion and canine inherited demyelinative neturopathy. The average lifespan for them is a healthy eleven to thirteen years long. Additional testing the vet may recommend is for their hips and thyroid glands. Dating all the way back to 1000 B.C., the Tibetan Mastiff is a bred with lots of history behind them. They have been reported as dogs that once traveled alongside Attila the Hun as well as Genghis Khan and were first discovered in China. Once used to protect campsites in Asia, they grew in popularity to begin guarding large villages and monasteries as well. In the late 1800’s, they grew even more fans by expanding to India and then used as guard dogs for farms and to guard other animals in a number of other countries as well. They are noted under a miscellaneous chapter in the AKC since the year 2005.